Water Gallery is the leading source for bubble panels and bubble walls. We can custom design a feature to fit any space. 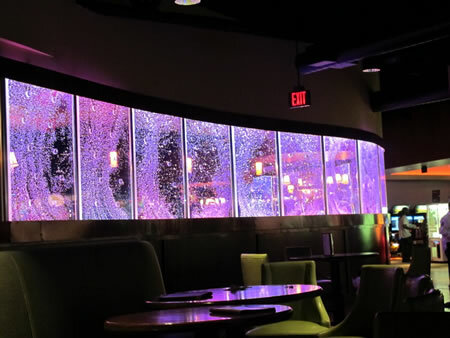 Each bubble wall includes spectacular color LED lighting and a wireless remote control. Engineered to last for many years, we use only the best quality acrylic, air pumps, valves and hoses on the market. Custom bubble panels are always impressive on first sight and can leave a lasting impression on many visitors. Each bubble wall is a unique work of art, and you can choose from a floor standing or wall hanging design. All of our bubble walls are sealed/encapsulated for minimal maintenance. Each tank is made to order, therefore smaller and larger tanks may have different bubble patterns. This variance is due to the different size and thickness of each individual bubble wall. We offer Free Shipping within the USA on all of our bubble walls and bubble panels. 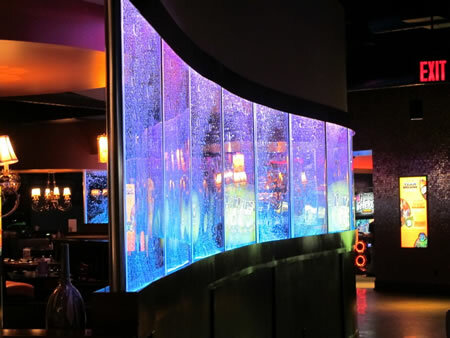 Contact us today at 866-518-6849 or email indoorfountains@gmail.com to discuss your project. We now offer Bubble Wall Rentals too! Why is Water Gallery the Best Place to Buy Your Bubble Wall? 1) OVER 30 YEARS of EXPERIENCE: You can feel confident knowing your bubble feature is built to last for many years. Our dynamic team of builders has over thirty years of training and experience designing and manufacturing water features. Our products are engineered perfectly and have been proven over time. 2) GUARANTEED LOWEST PRICES: We challenge our customers to find a lower priced bubble wall anywhere on the web. We will beat any advertised competitors price; just make sure you are comparing apples to apples. Many of our competitors use inferior quality parts to reduce costs. While these features may look good initially they do not hold up over time. 3) BEST QUALITY BUBBLE WALLS: We are the proven industry leader of bubble walls and offer a superior quality product. We use only the most durable components on all of our custom water features. Our fountains are commercial grade and built to last. You deserve the best and that is exactly what you will get when buying from us. 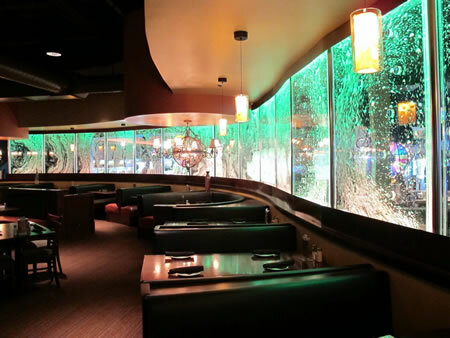 The Latitude 30 Bubble Wall below was completed in 2010 in Jacksonville, Florida. 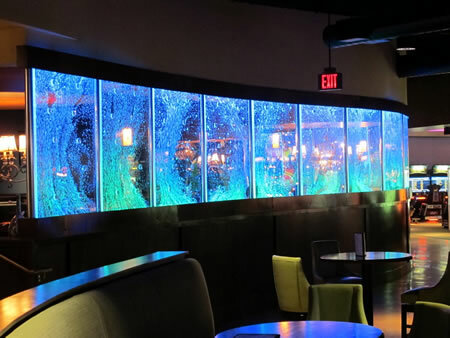 Latitude 30 is an upscale family entertainment facility and our custom bubble wall is a main focal point for their business. It consists of 16 bubble baffle tanks and color changing LED lighting. The feature is approximately 65 feet long and 5 feet tall. Total cost for the project ranges from $75,000 - $100,000 and includes on-site professional installation.